Bob Wiley (Bill Murray) has some problems and was just referred to Dr. Leo Marvin (Richard Dreyfuss) by his former psychiatrist, who is entering retirement early. Bob thinks Leo can help him, but Leo is about to take a month long summer vacation to Lake Winnipesaukee. Bob, scared to spend the month without his new psychiatrist, tracks Leo down at his vacation home. All Dr. Marvin wants to do is relax with his family, but Bob showing up puts a damper on his plans, especially when the rest of Leo's family really takes to Bob and starts inviting him places. From then on, Bob is a constant presence on Leo's vacation, quickly driving him insane. 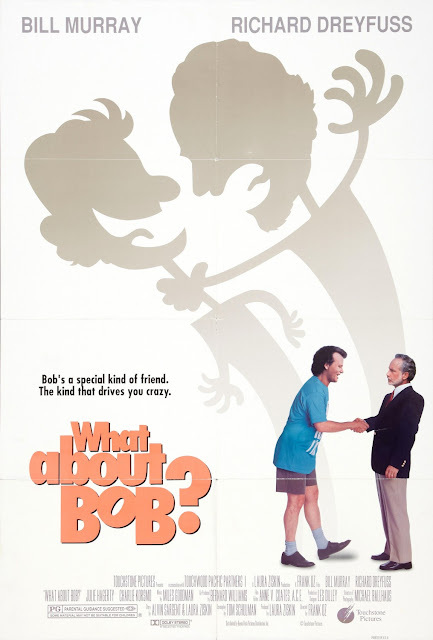 "What About Bob?" is an uproarious early 90's summer vacation comedy where a well-renowned psychiatrist named Dr. Marvin gets more than he can handle with his newest patient Bob Wiley, played by the ever funny and brilliant Bill Murray. The film opens with Bob waking up in his one room studio apartment with a humidifier blowing as he repeats his mantra: "I feel good, I feel great, I feel wonderful," not because he does, but because he needs to convince himself that he does. He works out of his apartment and his only companion is a goldfish named Gil. Bob has a lot of phobias and won't leave his apartment unless it is absolutely necessary. Usually when he leaves his apartment, it's to visit his psychiatrist. Bob's previous psychiatrist recommended Bob see Dr. Marvin, played very well by Richard Dreyfuss. Their first meeting seems rather inconsequential, setting up the characters and their attitudes. Bob quickly creates a bond to Dr. Leo Marvin and a necessity for him, even if Marvin doesn't know it yet. Instead of actually helping him with a few intimate tips on surviving a month without a psychiatrist, Leo almost brushes Bob off, merely handing him one of his self-help books and telling Bob to read it and work on himself while he goes on vacation. After all, Leo doesn't want to spoil his vacation, now does he? As soon Leo leaves, Bob finds that he can no longer function. He works out some very elaborate, very bizarre and very crazy lies to find out where Leo is vacationing. Once he finds out this information and makes his way there, though the journey is difficult for someone with so many phobias, this is when the real fun begins. From the moment Bob enters Leo's vacation, it becomes a constant battle between the two of them. Leo tries to hint at Bob to get him to leave, but Bob is too oblivious to the situations and never gets the hint. Every time Leo is rude or yells at Bob, Bob thinks it's some new form of radical therapy and goes along with it. Leo's family doesn't exactly help out as they welcome Bob with open arms and think he is a great person. Bob being with Leo and his family constantly helps him out tremendously as he makes strides and starts to conquer his fears. Meanwhile, in a hilarious reversal, Leo slips slower and slower, deeper and deeper into madness with many laughs along the way. This all works because the foundation of the story is solid and the direction is excellent, but it wouldn't be as excellent as it is without its actors. Bill Murray is so charming and funny as Bob. He is such a tremendous mix of crazy and crazy humorous, and he was the perfect choice for a character like this. He and Richard Dreyfuss play so brilliantly off of each other. Dreyfuss is also great here, and though he often had to be the proverbial party-pooper, he does it so convincingly. We can't help but laugh whenever he breaks into a fit of rage. Overall, we love watching this movie and it's the perfect fit for our SUN-day summer movie series! One year ago, we were watching: "National Lampoon's Vacation"